Greater Noida has emerged as one of the most reliable property destinations, in recent years. Developed on visionary master plans, this area of Delhi-NCR has one of the most advanced infrastructural developments. When it comes to property buying, it suits the needs of all. Buyers are hopping on residential apartments, golf-facing apartments, villas, and flats, available at many reasonable prices than other areas. Come here to buy a new pack of luxury in unbeatable prices rare to find in real-estate markets of Delhi-NCR. Godrej Properties Limited-A renowned name in the realty sector has launched its new residential project named Godrej Golf Links. The real-estate market in Greater Noida is going to see a new dimension with the launched of this new property destination. This new residential project is spread over 3 acres and offers all the luxurious amenities that one longs to get in dream-house. Having the best connectivity with peripheral areas, it offers a new range of luxurious villas. It is connected through Noida-Greater Noida Expressway, Yamuna Expressway, FNG Expressway and DND Flyover. 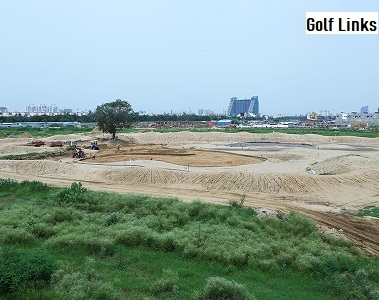 Nearest metro Golf Course is enough to give you speedy connectivity for commuting. It takes barely 2 minutes from Pari Chowk, 30 Minutes from Noida Sector-18 Metro and 30 Minutes from Akshardham Temple to reach here. It will have proximity to the upcoming international airport. Recreational space, essential amenities, and robust infrastructural facilities will give a new touch to your feeling while living here. Located along extensive 9 Whole Golf Course, it gives access to Godrej Park from windows of villas and internal pedestrians. You will enjoy a state-of-art sports arena, gymnasium, heated pool, spa, salon and much more, required for a family-living. Besides, in-house amenities include a designer kitchen, air-conditioning, marble flooring, private party terrace deck, and a private elevator. This lavish residential Villas in Greater Noida is available in different sizes according to the needs of buyers. Size space varies from 700 sq. Ft to 5335 sq.ft. There are 4 towers of G+7 low rise golf facing residences in the township, having 114 units. These spacious and majestic villas are available at fair prices. Price range varies from INR 42.50 lac to INR 3.27 Cr according to amenities and space available. The prices are expected to soar in near future due to high demand and upcoming infrastructural developments in this region.